For a super close up view, double-click on the pic to enlarge it.I took these pics with my digital SLR camera with a 400 mm lens and a 1.4 extender--combining that with the multiplier of 1.6 because it is not a full frame camera, I am shooting the equivalent of close to 900 mm. It is unethical to approach nesting herons or other birds too closely--they do flush from their nests when humans are close (which I observed this week when the owner of some cattle that had strayed into the area walked right underneath the nests) which puts eggs and very young nestlings in danger from the elements. 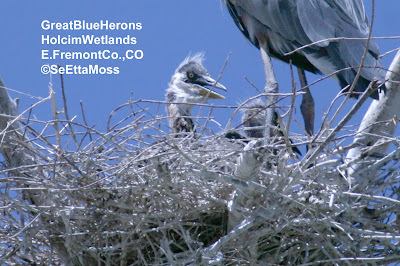 Also Great Blue Herons as well as other birds do abandon their nests and nestlings due to too much disturbance. If you want good photos of these birds it is your obligation to get the photo equipment that does not put the birds at risk.